Stage 1 London. When I arrived in London I had time to meet my friend Eugenie who I had first met 10 years ago on my first marathon. We had a quick cuppa and a catch up before going to see if we could resolve the rather bizarre check-in problem which had resulted in my bag being checked all the Punta Arenas, but not me. First attempt failed but we were directed to another desk and success. All it took was for the airlines flight code to be entered instead of the operator’s code: so simple and so obvious, and yet so hard to do apparently. Stage 2 Madrid. This was also uneventful, although there was no in-flight food or drinks unless you purchased them: Iberia is not BA. No bother I thought, I could sort myself out a Madrid. To my surprise Madrid had very limited options: Burger King or a sandwich shop. Do I go against principles a have a death burger? No. Sandwich shop it was and a 3.5 hour wait for the next flight. Stage 3 Santiago. This was long: 13 hours. It seemed to be going well. I got more sleep than expected and felt great until about 2.5 hours out of Santiago when I started to get a really severe headache and felt really sick. I could not eat breakfast. I managed to doze a little more, and distracted myself with a film. Another amazing distraction was the incredible sunrise as we flew over Brazil. It was on the other side of the plane to where I was sat but what an amazing scene: a riot of intense pinks, red, purples, blue and lilacs. It was truly awesome and I can honestly say I have never seen anything like it. That was followed by the most intense turquoise I have ever seen. The bonus at my side of the plane was to come shortly: the Andes. They are magnificent, and from the plane you can seem them in full glory: jaw dropping. It was hard to decide which was better; the sunrise or the mountains. I had a sickly and wan trek through immigration and customs before seeking a quiet corner to try and sort myself out. I decided to go for my patented, if in doubt cure that I use on ultras: pour in as much liquid as possible ideally with caffeine and sugar, along with painkillers. A litre of fluid and two Migraleve later I was starting to feel a bit more human. I had totally underestimated how much I needed to drink to compensate for the dehydration induced by flying and flying for such a long time. The main reason I had felt so ill was dehydration. Something I should have picked up on quicker than I did. A rookie error and a lesson learned. I won’t be making that mistake on the way home. Other runners started to appear, starting with Alexander from Austria who is a veteran of the North Pole marathon. One of the benefits of having my name and Antarctic Odyssey logo emblazoned on a t-shirt was that it made me immediately identifiable. It was good to finally start to meet up with the others and our common goal, excitement and nervousness meant that we started to gel as a group really quickly. Stage 4 Punta Arenas. This was another 5 hour flight with a touch-down mid-way down Chile to re-fuel, let some passengers off and more board. During the time we were on the stand we got a chance to move about and talk some more. I met some runners from Australia and the US, a fellow Brit, and introduced myself to Richard Donovan who organises the event, Mike the photographer, Dave the cameraman and Fergal who assists Richard with the event organisation. I was lucky to have got the best side of the plane again. 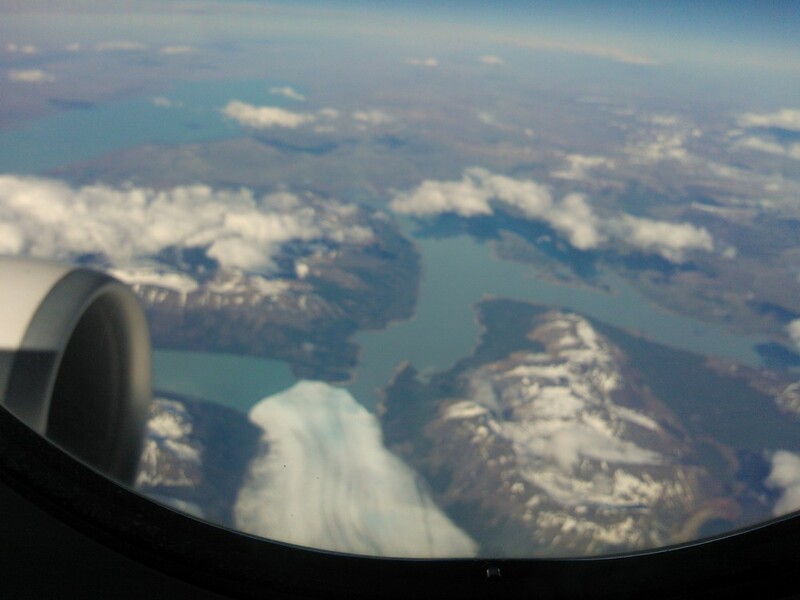 As we flew down the length of Chile I got spectacular views of the mountains and Patagonia. Snow covered peaks and the archetypal conical volcano tops, ice flows, frozen lakes all clearly visible from the plane. I was awed at the sheer beauty that I was already experiencing on this trip and this even before getting to Antarctica. On arrival at Punta Arenas a weary group picked up their bags and shared a mini-bus ride to the hotel which was located on the sea front. Quick change and out to eat. Punta Arenas is apparently not known for its cuisine, but a few of us joined the guys in the know, namely Mike and Dave, and headed to a bar where pizza and salad was the order of the day, along with a beer. Not exactly traditional Chilean cuisine, but to be honest I was so hungry and so tired that a simple pizza and salad was perfect and about all that I could manage. Back to the hotel, where I did not even take time to unpack, (I always unpack), but just crashed into bed and slept through to 3am when my body clock which was still clearly on UK time though it was 6am. I was also totally confused thinking I was at home but realising something was not right. I dropped back off to sleep. Settling into Punta Arenas and kit inspection day. I got up at 6am giving up trying to persuade my body that I needed more sleep and that it was not really 9am. I unpacked and laid all my kit out ready for inspection later in the afternoon. Then I had a long hot shower, which felt so good. After that I Skyped home and had a chat with Alasdair and the girls. They had had an early morning alarm call courtesy of the cat bringing in a live magpie, which caused much shrieking and chaos not just from the magpie. Rowan was something of a ghostly presence as she was very hung over from a party. I was instructed to drink lots of water as I actually sounded dehydrated. Is it even possible to sound dehydrated? It would seem so. After the call I headed down to breakfast. This was the first opportunity to meet the majority of the runners as most of us were staying in the same hotel and had arrived at various points the previous evening. I quickly realised that I had some lovely and really interesting compatriots, with so many great tales and experiences. Runners are the same the world over: a friendly, sociable and supportive bunch. I ate a huge breakfast including cake (most unlike me), a lot of lovely strong coffee and lots of water and fruit juice. I sat at a table with fellow Brits Martin & Sarah Steer and Flick Goddard who recognised me from Facebook, we immediately got some good banter going and agreed to meet for a run shortly after breakfast. the weather back in the UK. All along the waterfront there were references to Magellan with a series of ships prows pointing out to sea. There were some interesting wooden carvings referencing Easter Island, and another spot where there was information about the local sea birds. We also passed a Tsunami warning sign. It would appear that we were in a tsunami zone. After the run I went into the town to find my bearings and get a feel for the place. Punta Arenas is a small town that appears to have fallen on hard times, but there are signs of investment and regeneration. I suppose I could liken to it to somewhere like Greenock on the west coast of Scotland. Sitting where it does at the very foot of Chile and close to the Magellan Straits its main industry has always been the sea and a jump point for the southern oceans and Antarctica. I found a little chocolate shop and cafe. Martin, Sarah and Flick had also found it. It was full of character and just right to while away some time on a damp Sunday afternoon. I had a lovely chicken and avocado sandwich and green tea before heading back to the hotel for the kit inspection. This was an important stage in the final preparations for the trip. Our kit had to be inspected by the logistics company, ALE, that would take us to Antarctica and who ran the camp we would be staying in. I had heard stories of failed inspections where kit was missing or not to standard, and people being taken into the town to buy or rent kit and how costly that could prove. In my heart I knew my kit was to specification and that I had everything that was needed, but there was still a slight nervousness as awaited the knock on the door. I need not have worried. The inspection was brief and I passed with flying colours. My thoroughness and organisation were commended. Phew. Breathe and relax. We had an informal briefing from Richard early evening to explain the next steps in the process and to set our expectation before the formal briefing from ALE the next day: the ‘scary briefing’ which would tell us about the camp and the environment, the dos and don’ts and health and safety. We were also given our race numbers and t-shirts. I was #28. It was all getting very real now. It was election day in Chile. The town was buzzing and the turnout was large, so many people coming to vote and the exercise their democratic right; and such an air of excitement and expectancy. It certainly puts the UK to shame with its low and unenthusiastic turn outs for elections. By mid-evening the result was known and as we headed out to find some dinner Punta Arenas was partying. Finding food on a Sunday evening which was also election day proved to be something of a challenge, but after several false starts we eventually found something. It was pretty mediocre, but it didn’t matter. We were enjoying each other’s company and the anticipation of what was to come. Formal briefing, bags collected and we get put on standby. Breakfast was followed by the ALE briefing. It was informative and more light hearted than I expected, but at the same time it was made clear just how harsh the environment that were going to is and how important it was for us to take and be sensible. Our bags would be weighed, labelled and taken for loading onto the plane at 4pm. We were told that conditions were right for the flight and that we were now on standby with even a possibility of a flight that night. There would be an update just after 7pm that evening. I decided to go out for another run, on my own this time. We had been told that wind was a feature of Punta Arenas, and it was putting in quite an appearance today. I had a tough, wet and chilly 2.5 miles out and back. It blew away the cobwebs and set me thinking about the conditions I might get during the marathons. It was chance for me to get some head space and start to prepare and get into my zone, a chance to think about what was coming up and to rationalise any worries that I had and to ease the nerves. By the time I got back, showered and changed I was definitely ready for lunch. I hooked up with a runner from the US, Adjoa, and we headed off the Chocolate Cafe for lunch. We chatted amiably about running, our families and our work while eating huge sandwiches knowing that that we really needed to be eating a lot now. Adjoa was one of 10 runners who would complete their 7 continents; a great achievement. After the bags were collected a small group of us decided to visit the cemetery, which had been recommended to us as being really interesting and beautiful. A number of guides rate it as one of the world’s most beautiful cemeteries. I have always loved graveyards. I find them calm and contemplative. I relax there, and so it seemed like the right place to spend some time before embarking on my challenge. It was a remarkable and beautiful place from the walls of small shrines, to rows of white table-top graves to the elaborate mausoleums, and the rows of carefully manicured trees. From the names on the grave stones it was possible to build a picture of all the cultural influences on the town: Scottish, English, Welsh, French, and Dutch were just a few. You got a real sense of the history. Many of the shrines and graves were well tended and clearly visited frequently, and you got a real sense of lives being celebrated rather than loss being mourned. After a relaxed and calming stroll round I returned to the hotel to wait for the flight update. I was calm, collected and ready. We congregated in the hotel foyer at 7.15pm, where there was a quiet buzz of expectation. Just before 7.30pm Richard confirmed that we would be flying the next day, advised us to check out, and then gather in the foyer at 5.15am the next morning. This was followed by a quiet dinner with Adjoa in another cafe recommended by some of the others who had found it in the afternoon after visiting the cemetery, and a chance to try some Chilean style food. I had pumpkin ravioli in a light soup with cocoa in it and a lovely fresh mixed salad and Adjoa had a traditional corn tart which was like a quiche made with a corn puree. We then drifted back to the hotel and I had a shower, packed the last of my things and set the alarm for 4.30am.